With Audi’s brand new A3 showing its face officially at the Geneva Motor Show last week, it is time for us to say goodbye to the previous series and share with you our personal experience with the final hurrah and subsquentely the most powerful version of the current A3-series available; the Audi RS3 Sportback. So what do we have here? This is the Audi RS3 Sportback, a hot hatch with 340hp, four-wheel drive and a seven-speed dual-clutch gearbox. It’s the smallest, cheapest RS model ever produced by Quattro GmbH. It is essentially a TT-RS with the practicality of a five-door hatchback. So it seems the Germans granted us the same fun factor with the ability to take at least three people along to experience it. That sounds like a win-win situation. Let’s kickoff with the engine. The Audi RS3 is driven by the 2.5 liter five-cylinder turbocharged engine, producing a maximum power output of 340hp between 5,400 and 6,500rpm and a torque figure of 450Nm between 1,600 and 5,300rpm. Just below 50 centimeters in length, the engine is compact compared to its power output. The lightweight design results in an engine weight of just over 180kg, giving Audi the ability to reduce weight at the front and improve the RS3’s handling. The engine propels the seven-step S-tronic dual clutch gearbox, giving you a 0-100km/h sprint in 4.6 seconds, 0.4 seconds slower compared to the TT-RS and one second faster than the Audi S3. The S-tronic gearbox has a launch-control function, enabling you to accelerate with a minimum of wheel spin. Controls are available behind the steering wheel and between the two front seats. The paddle shifters as well as the gear selector lever gives the driver the option to change gears manually. The gearbox converts the power to all four wheels with a torque balance of 40-60 percent, front to rear split. The seventh gear is configured as “overdrive” for easier long-distance Autobahn runs and often used by the D-mode. In Sport mode, it makes the gearbox and throttle response much tighter. The S button on the console opens the twin exhaust valve for more engine sound. 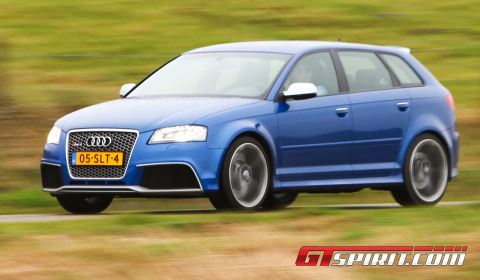 The top speed of the RS3 is electronically limited to 250km/h, but can be extended maximum to 280km/h up on request. 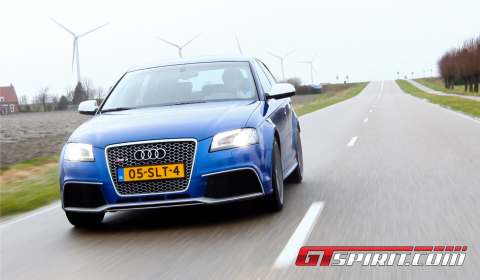 The power delivery and the response of the gearbox is quite similar to the Audi TT-RS. Audi didn’t change anything to the characteristics between both cars. It is mainly the difference between the S3 and the RS3 that’s the dealbreaker here. The RS3 is way quicker than the S3, which is quite logical. The four-wheel-drive offers more grip and no torque-steer or front-wheel scrabbling. Only in some high speed corners you might notice just a little bit of oversteer. The amount of additional oomph is delivered by the wonderful high performance five-cylinder turbocharged engine in the front of the smallest RS. So what about the handling? The suspension uses a front McPherson strut and on the back a multi-link has been stiffened up so that the RS3 is 25mm lowered than the standard model. Although the suspension feels stiff, it copes very well with bumpy roads. The upgraded driveline is supported by a reworked chassis that uses a 22mm wider front track, along with firmer springs and dampers, beefed-up anti-roll bars and subtle changes to the valving of the electro-hydraulic steering. 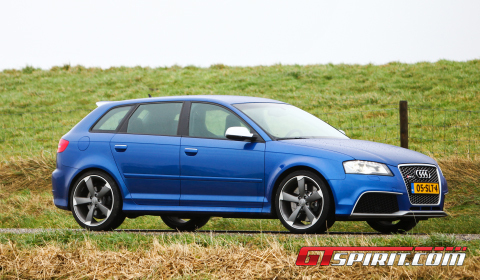 The RS3 Sportback is clearly distinguished from the regular A3 and S3 models by its overall looks. On the front it has a striking grille, available in standard, matte aluminum and black, larger front intakes and an RS badge. It gets wider wings too, finished in carbon-fiber reinforced polymer, for a 1.8kg weight saving. The back the RS3 looks quite harmless, but is fitted with an attractive diffuser and a well balanced roof spoiler, plus an additional RS-badge. The RS-theme continues with matte-aluminum side mirrors, but another common RS styling element, wide-set dual oval tailpipes, is missing from the RS3. The RS3 comes standard with the 19 inch five-arm rotor shaped rims, available in standard light metal, titanium and black with red details. Interestingly, Audi opted to fit a set of tyres that are 10mm wider at the front than at the back. The reasoning behind this is to add to the levels of grip available at the front and reduce the tendency to oversteer. Tooling restraints for the A3 body may also have played a part. Inside the cabin, you get sporty seats finished in Silk Nappa leather, a flat-bottomed RS-steering wheel, RS-styled door strips and aluminium pedals. As an option you can upgrade the seats to RS bucket seats with more luxurious Fine Nappa leather and aluminium race inlays. The overall space in the front is more than sufficient, but in the back you might feel short of space if you have longer legs. The quality levels are more than sufficient and the whole cabin breaths the Audi-styling. The boot at the back offers between 302 and 1,032 (with the rear seats folded) liters of space. The Audi RS3 Sportback is all that you need in a superfast hot hatchback, capable of combining everyday driving and excellent performance in a well resolved package. It is a dynamically accomplished car with mannerly behaviour. The RS3 is relatively docile when driven with mild inputs to the throttle and steering, but it comes alive when unleashed with an urgent right foot and positioned in S-mode. Then it is an exhilarating car to drive, like it sister the TT-RS. Within its segment there are no other options, the RS3 excels in practicality and power delivery with its intoxicating engine note providing the answer to people that opt for a compact four-wheel-drive car with need for space and four doors. For those people the RS3 is the only option available market. Others have more choice, like the BMW 1-Series M Coupe.